a farewell coffee date. take some time to breath, sip a warm drink, and share with your new blogging buddies. if you’d like a prompt: how did the blog-tember challenge go for you? any surprises? what was your favorite prompt, or what would you like to see included next time? here we are, the end of september. the end of blog-tember. having a farewell coffee date. except i’m drinking a protein shake. it feels like this challenge took forever but it also feels like it barely happened. i don’t know about you but i have mixed feelings. i loved the prompts and i am going to miss them! but at the same time it will be nice not to post everyday. i just want to say thank you to bailey for coming up with this challenge! i cannot imagine how much time and effort it took to orchestrate this thing! i really appreciate you being such i wonderful host. i will gladly participate in anything you do in the future! i feel so proud of myself, you guys. i cannot believe i actually completed this. and you should feel proud too! even though this is “just a blog” and “just a writing challenge” it has made me learn more about myself in a month than i have over a longer period of time. – what kind of posts were my favorite to write and what i will write more of. – that making a vlog isn’t as scary as i thought it would be. but it takes way more time than i thought. – that i need to make a plan for writing and scheduling posts in advance so i don’t stress. – learned that i really love writing, but only about things i am passionate about. also, how to write quicker! – that i want to use more of my own photos, so that means i need to take more. – that i love making “friends”! you all have been so inspiring to me and i love that i have “met” you! you seriously don’t know how much you have helped me and for that, i love you! – what things are really important to me. – sort of where i want my life and this blog to go. – that i can do things that are really hard and that i really want to do, if i stay determined. – even though hard work is well, HARD, it is so worth it. my mom has been trying to teach me this for forever! – that people will love me for being me. and the people who don’t, aren’t who i would want to be around me anyway. – that just starting is better than waiting until the “perfect” time. it will never come. just start and grow from there. – that i love my husband even more because he is so supportive of my dreams and goals, even if it means less time is spent with him. i COULD NOT have accomplished this challenge without him. i have proved to myself that i can do hard things. that even if the things i do aren’t THE BEST THING EVER in my mind, that people will appreciate them still. i don’t have to be perfect to be loved. DAY ONE: about the author this post was really hard but i LOVE the turn out. i am going to put it in my about page. DAY FOUR: trends this post was one of my favorite to write! it took me two days and thats because i was so passionate about it! i definitely want to write more posts like this one. DAY NINE: INFJ personality type i loved taking the quiz and finding out which type i am and learning i am not a weirdo! and how to explain my introverted extrovert-ness. i loved learning about other peoples’ types too! DAY TEN: self-love this was one that was hard but so worth it. self-love is so important! it is something that i want every person to have! i can not talk about it enough! you are amazing and beautiful and talented and so am i! DAY FIFTEEN: my new home it was so fun to create a mood/vision board! i will definitely do this in the future! DAY SEVENTEEN: my first vlog making a vlog was so fun!!! i will definitely be doing this more often. it wasn’t as hard as i was expecting to sit in front of my ipad and talk. DAY NINETEEN: where is the love? so easy for me to write. another topic i cannot ever stop talking about. love love love!!!! DAY TWENTY-THREE: viva las vegas i felt strongly that i needed to shed more light onto what there is to do in las vegas! it makes me so mad that all the media cares about is the “party” part of vegas. that’s not all there is! DAY TWENTY-SEVEN: wishlist i love shopping so putting it all in a post was fun. it’s like making a shopping list!! haha. and i loved sharing the things that i have bought and love with you all! i want to do this in the future. DAY TWENTY-NINE: blogging tips for beginners even though i am a beginner myself, i love giving advice! especially when i’m not really qualified to! haha. just like in real life! if you want to see a list of all of the posts i wrote for blog-tember you can click here. thanks you so much for following along and reading! what was your favorite post to write or read about? thanks darlin! i’m glad you agree with me. P.S. What ARE you drinking????!!!!! i know, i’m teasing you!! 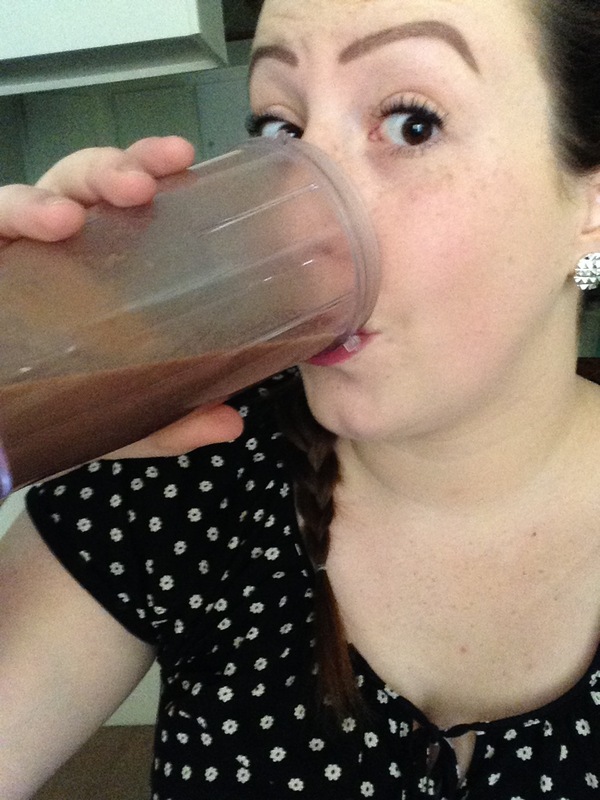 it’s a chocolate protein shake! what else does it look like?! you should see the green smoothie i like to make! I’d love to have a glance at your smoothie recopies, i’m just getting into them m’self and you said chocolate so….it’s pretty much perfection in a cup. Give me your email and I’ll tell you my favorite ones! Totally agree about just starting somewhere. The perfectionist in me hates it, but it’s never going to be perfect anyway, I just have to do it. So neat to see all the things you learned about yourself!